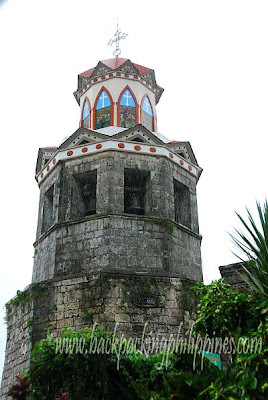 Even with the unrelenting rain, Tutubi was urged by his friend to at least visit two more attractions in Samar before heading back to Tacloban for his 6pm flight to Manila via Cebu Pacific. They were able to at least travel for more than an hour more even with almost zero visibility by driving slowly since his guide knows the place quite well. 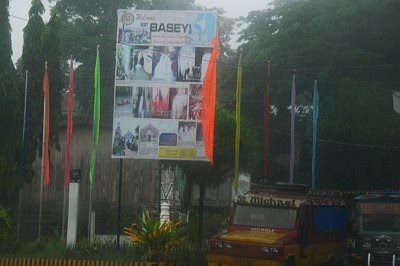 Basey, pronounced Basay, is a sleepy town in Samar opposite Tacloban City that has earned a place in the Guinness Book of World Records for making the longest Banig (sleeping mats). The town is home to numerous mat weavers. Sadly, no remnant of the record-breaking long mat was seen by Tutubi. The town celebrates its town fiesta with the Banig Festival in September. 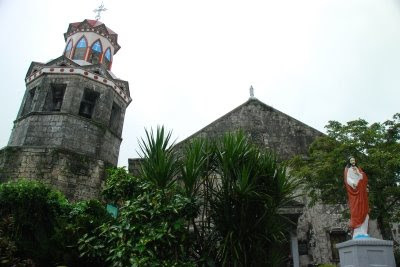 What he saw in Basey was the old Spanish church of Basey, the San Miguel Arcangel (St. Michael the Archangel Parish) with the bell tower indicating the year 1846. He wasn't able to get out of the car, again, due to heavy rain and had to take a picture of the church while inside the car and through the glass. The most popular destination of Basey is the Sohoton National Park for adventurers and eco-tourism enthusiasts looking to explore caves, waterfalls and other activities. Tourism is the area is not well-developed and marketed and hampered by the lack of tourism infrastructure and not-so-good roads. For information, try to get in touch with Sohoton Services Association (SSA) to provide you with caving guide, kayaking guide, food as well as souvenirs and rest houses. Commute: From Tacloban Bus Terminal, board jeepneys or mini-buses/vans bound for Basey for less than an hour trip. Driving Directions: Basey is less than an hour drive from Tacloban via San Juanico Bridge. Direction signs are present so you won't get lost. Drive carefully due to the presence of potholes along the way, something Samar island is "famous" for. first time i hear of this town, trendsetter ka talaga tutubi. glad you ventured out to capture these even when the skies were not cooperating. That Spanish Church looks pretty special. Shame there were no weavers available! Awesome blog! But... how can I get in touch with the Sohoton Services Association? Thanks!